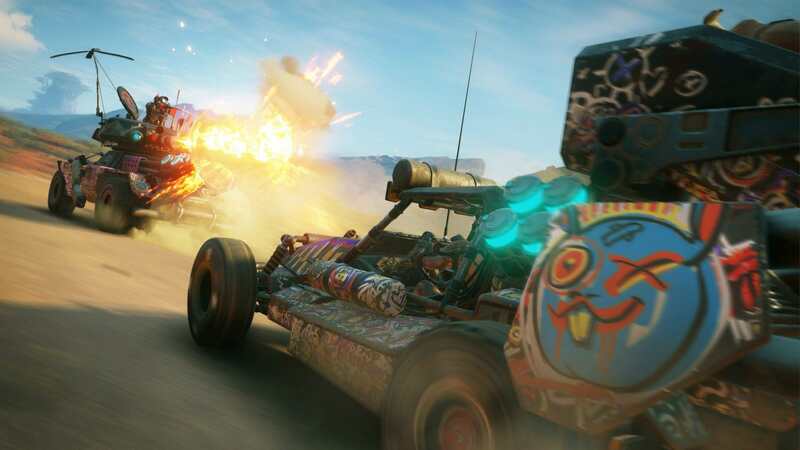 It's fitting Rage 2's vision of post-apocalyptic life revolves around graffiti and brightly-haired punks who look as though they follow a strict "here for a good time, not for a long time" lifestyle. Everything about it seems punchier than its much-maligned predecessor, as though the upcoming first-person shooter is something closer to a renegade cousin to the id shooter than a formal sequel. And after spending some hands-on time with it at E3, I think there's merit to that notion. But in revamping the Rage brand, Rage 2's wears its influences like punk rock patches on a shiny new leather jacket. 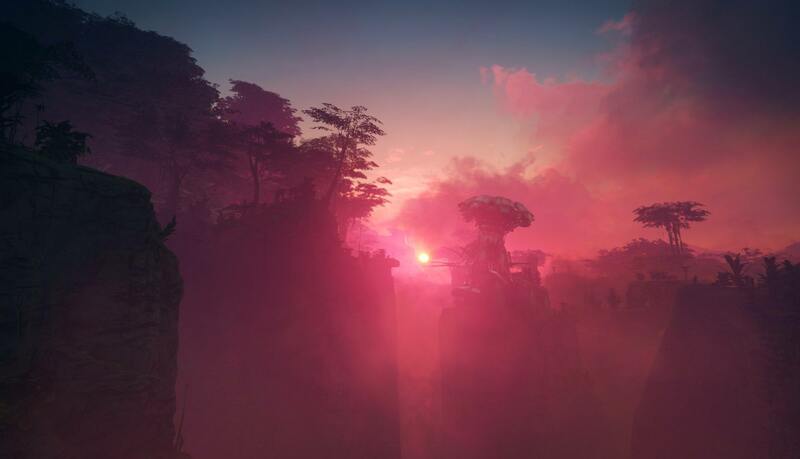 That isn't to say that Rage 2 lacks its own identity. Before my demo began, I watched a short video detailing some of the game's different environments, factions, and vehicles (Bethesda wasn't demoing any of the car-based gameplay at E3). As expected, they're all equally over the top. Rage 2 doesn't seem to be a game that cares about restraint. It's unhinged, all violent and edgy in the way that, when the bullets start flying, comes together quite nicely. The short demo started with a brief introduction to Walker, the Texas Ranger that players control throughout the game and his Nanotrite skills. Nanotrites are the basis for Walker's offensive and defensive abilities. They're superpowers, more or less, capable of reducing even the wasteland's toughest inhabitants to putty when used in conjunction with Walker's impressive arsenal of high-powered guns. One's an evasive, omnidirectional dash. Shatter is an explosive push. And lastly, there's Slam, which has Walker leap into the air and land with enough force to wreck anything in his immediate vicinity. Armed with an understanding of Walker's Nanotrites and an earnest desire to see just what the hell is going on in Rage 2, I began the demo proper. There's a lot going on in Rage 2, both visually and mechanically, but it feels like an irradiated mashup made from bits and pieces of Bethesda's recently published titles. It's hellishly fast and full of delightfully violent visual feedback, not unlike Doom. The Nanotrite skills, with their supernatural ability to turn the tide of impossible situations in the player's favor, echo the Outsider's gifts bestowed unto Dishonored characters. Even the way that Walker can approach enemies with stealthy intentions, throw a curled wingstick at an unsuspecting foe and then unleash holy hell on whoever's left standing evokes a certain fluidity similar to Wolfenstein. But all of those similarities and gameplay parallels meld together once the shooting starts. Rage 2 is fiendishly fast. The demo level weaved from shootout to shootout as I guided Walker through a rundown corporate facility. The wastelanders occupying it aren't exactly unstoppable -- life post-apocalypse undoubtedly toughened everyone up -- but they know how to take a beating. Because of this, it's best to line up headshots, mix in some Nanotrites, and stay mobile at all times. There's an arcade-like simplicity to Rage 2's violence, despite the game's top-tier visual tech. It's a game about shooting people, and that shooting feels exceptional. And to sweeten the deal, Rage 2 does a great job of rewarding dynamic play. Chaining kills and utilizing Walker's abilities grant a combat multiplier. With enough subsequent kills, Walker can use Overdrive, the perfect summation of Rage 2's frenzied take on the open-world shooter. It's the digital version of PF Flyers, except instead of guaranteeing that players will faster and jump higher, Overdrive makes Walker move a little faster and fight a hell of a lot harder. 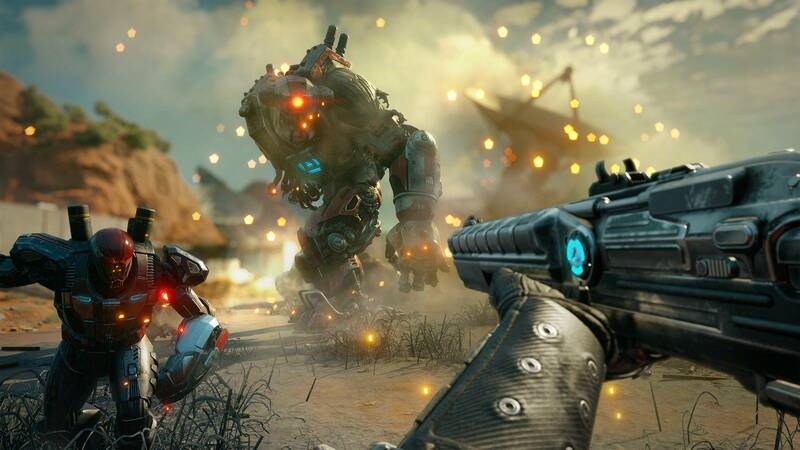 With Overdrive, Rage 2's gameplay loop becomes something like a constant return on investment: the more you kill, the more you can use Overdrive, and the longer you're in Overdrive, the easier it is to push forward. It's not uncommon for a first-person shooter to feel both violent and graceful. 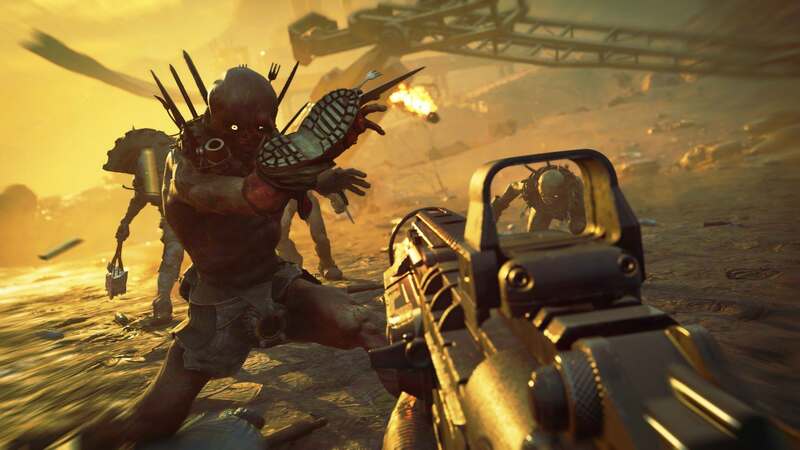 Rage 2 isn't clumsy, but it's far from elegant. It's more bucking bronco -- all raw energy and power -- that uses violence as an exclamation mark rather than a period. Walker's shotgun launches enemies into the air and melee attacks land with a sickening crunch. The Slam Nanotrite feels as powerful as it looks and the wingstick is the perfect compliment to an offensive arsenal. Walker's not overpowered -- I had to duck and heal during a few fights -- but everything about the way the game is designed seems to try and trick you into thinking that you are. All told, I finished the demo in under thirty minutes. In that half hour, I mowed through hundreds of enemies, threw more grenades I usually do in an entire game, and smiled every time I saw my combat multiplier go up. If Rage 2 manages to balance vehicular combat, shooting galleries, and a decent world to explore, it's destined to be a hit. If not, well, at least it's fun to shotgun some bandits in the face.